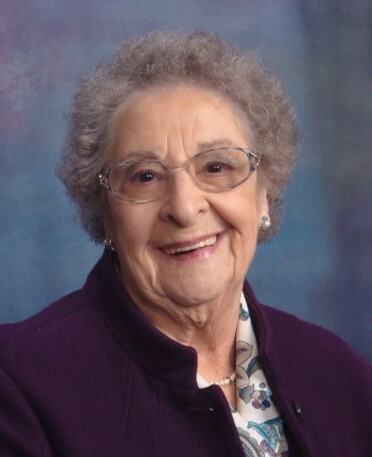 Obituary for Evelyn (Sunderland) Scritchfield | Timothy A. Berkebile Funeral Home Inc.
Evelyn Scritchfield, 95, of Bedford, passed away peacefully on January 18, 2019 at her residence. She was born on December 4, 1923, at the family home in Burnside, PA, a daughter of the late Dale R. and Dora (Hoch) Sunderland. On January 15, 1944, in Boise, ID, she married James R. Scritchfield who preceded her in death on December 4, 2000. She is survived by two daughters, Jamie Elder widow of Thomas, of Pleasant Valley, MO, Pamela Montgomery and husband John, of Bedford, PA; four grandchildren, Matt Elder and wife Becky, of Kansas City, MO, Erin Shonkwiler and husband John, of Liberty, MO, Tyler Montgomery and wife Michelle, of Dumfries, VA, Seth Montgomery and wife Sara, of Allison Park, PA; two step-granddaughters, Wendy Pinta, of Upper Arlington, OH, Jill Pinta-Guerra and husband Alex, of Oak Harbor, OH; ten great grandchildren, Matthew and Elizabeth Elder, Caleb Shonkwiler, Savannah and Robert Montgomery, David and Clara Gallapoo, Emilie Petersen, Maximus and Mary Gillespie; a brother, Bruce Sunderland and wife Louise, of Akron, OH; a sister, Sara Jane Reams widow of Max, of Pompton Lake, NJ. She was preceded in death by a daughter, Susan Scritchfield wife of Dr. Emil R. Pinta, who survives of Columbus, OH, three sisters, Dorothy Hoehne, Ethel Linder, Dottie Hall Ogden, and great grandson, Jacob. Evelyn’s childhood nickname “Sunshine” described her fun-loving, accepting, cheerful and positive personality. She was a member of the girls’ basketball team and a cheerleader at Cherry Tree High School, Cherry Tree, PA. After high school, she supervised assembly of precision electrical insulators with Isolantite Manufacturing Inc., in Newark, NJ, as part of the WWII effort. She enjoyed train trips into New York City to hear the big bands of the 1940’s. Evelyn was a resilient member of the Greatest Generation. After marrying her war-time sweetheart stationed in Boise, ID, she began her family, then returned to Pennsylvania, taking pleasure in mothering, gardening, green glass collecting and travel. Evelyn worked as a Teacher’s Aide through the Bedford Area School District. She delighted in patiently working with students who needed extra attention. Evelyn was also an Avon Representative for many years. Visiting neighbors and friends from her front porch or under her grape arbor were favorite times for her. She was also a woman of great faith and a charter member of the Bedford Church of the Brethren. A Celebration of Life service will honor Evelyn at 10:30 AM on Saturday, March 23, 2019 at the Bedford Church of the Brethren, 310 Donahue Manor Road, Bedford, PA 15522 with Pastor Janice Glass King officiating. Memorial contributions may be made in Evelyn’s name to the Bedford Church of the Brethren, P.O. Box, 107, Bedford, PA 15522. Arrangements by the Timothy A. Berkebile Funeral Home, in Bedford. Our online guest book is available at www.berkebilefuneralhome.com.